From a fireplace to a door lintel, and from a bas relief on a wall to a courtyard sculpture, fountain or caryatid (column within a building), there is an infinite variety of possibilities for including a sculptural feature into architecture projects and existing sites. 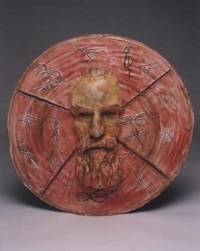 Since this sculpture website is mostly concerned with busts - here are just a few examples of the options wherein "sculpted faces" in any medium (bronze or plaster or concrete or reconstituted stone) can be used as elements. Fireplace surround Traditionally a fireplace surround can contain any decorative element. Why not faces - either timeless and anonymous or specific faces? 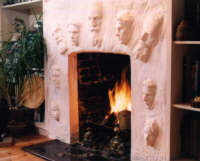 Relief panel These can be cast for outdoor use in bronze, or in reconstituted stone or cement (with added polymer for weather resistance) or for indoor use in any suitable medium such as plaster or resin. Finish can be raw or painted or decorated with "faux" (marble, stone or other) patterns. 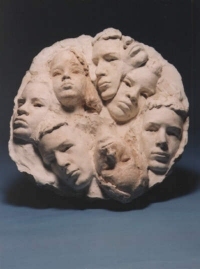 We can create new "faces" with which to construct an architectural feature or we can draw upon our existing stock of previously commissioned busts including Caucasian, African and Asian faces. For architects, designers and manufacturers as well as private indiviuals we offer the option of creating architetcural elements as originals only or as limited edition sculptures.